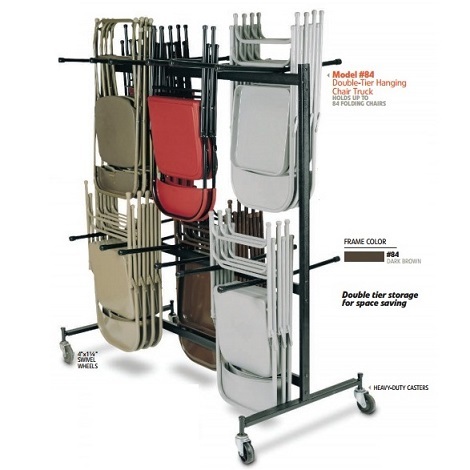 This 84 chair caddy is perfect for churches, schools, rental halls, and any organization that hosts large gatherings and banquets. 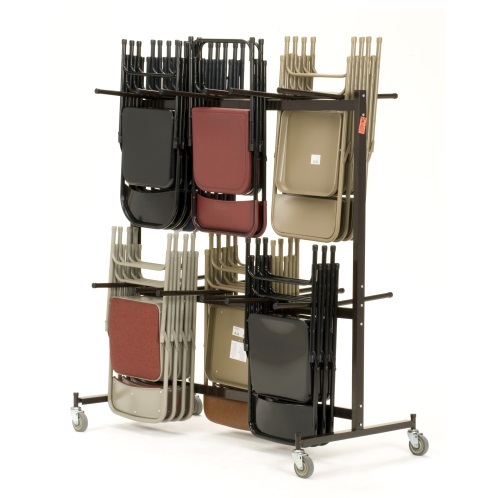 This particular chair cart takes up more vertical space rather than horizontal space. The heavy-duty wheels allow you to roll it over carpets, wood, tile, and any other indoor surface. Weight Capacity is 1200 lbs. or 300 lbs. per caster. The distance between hanging rungs is 13.5 inches. 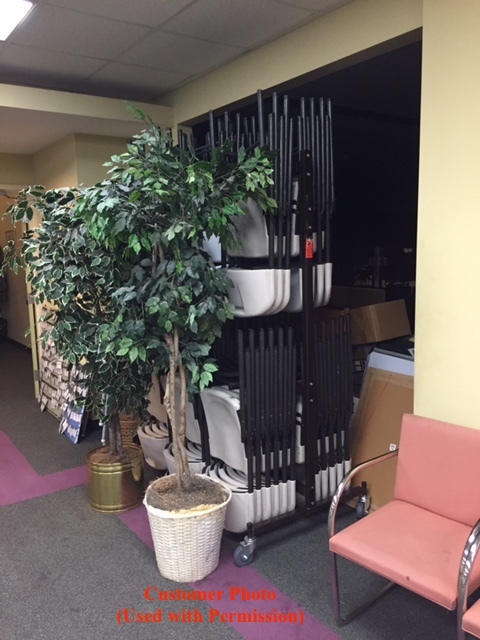 When chairs are out, use chair racks as a coat-rack with removable rods. 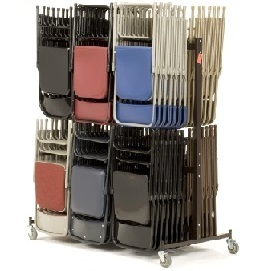 Chair Storage Carts are an NPS In-stock Item, ships within 48 hours! Comes standard with Colson soft rubber casters. This chair cart is designed for chairs with a 38 in. height. The NPS chairs 602, 3200, and 1000 do not fit on this cart as the height is 43. There is an adapter sold separately (model EXT-8) that accommodates taller chairs. 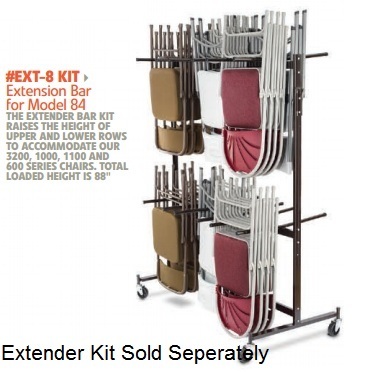 If you are using this for the Lifetime Brand folding chairs you will need to add the EXT-8 chair caddy extension kit to your order. I looked at a lot of sites. This was the best deal and easy to put together. We are very pleased with the unit. 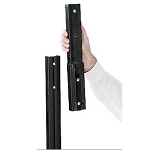 Went together in a snap and is very stable and provides us an excellent option for the metal chair storage at our church. We did find that this 70' tall model, when loaded, would not clear the 80' door frame into our storage room and lowering the chairs to hang them on the other chair rung did not allow the lower chairs to hang properly without dragging so well be slightly modifying the door header to accommodate the loaded chair rack. We also are using bungee cords on each 'arm' attached from outside to outside to insure that we do not have a chair fall off in transit. Nice and solid. Thanks for a great product! Fantastic product! Creates so much more room in storage closet. Have been in this building for six years and fighting chair storage the entire time. Fully loaded, the rack is sometimes hard to get rolling for one person. The only thing that I will watch over a period of time is the tires. I could see a flat spot developing if the rack is full and stationary for any length of time. Still satisfied though and wish we had purchased sooner! The chair caddy not only looks good and holds all of our extra chairs at the church, but it is also very well built. It rolls smoothly and easily from our storage room to the fellowship hall. 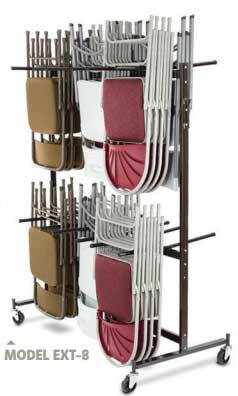 I would definitely recommend this product to anyone that needs the extra chair storage! We have about 40 wooden folding chairs for various family events. We were storing them on makeshift racks in our basement, but decided that we were getting older and the stairs were a challenge and decided to to store them in our garage to eliminate the stair problem. Carton arrived and my wife and I (82 and 75) were able to assemble. Unit is strong, stable and easy to move. Very pleased with this product, sturdy, easy to assemble, rolls very easy. I do recommend the extension, it is worth the extra money. the chair hang better with it. loved the fact it was free shipping, other places I looked the shipping was over $100.00. 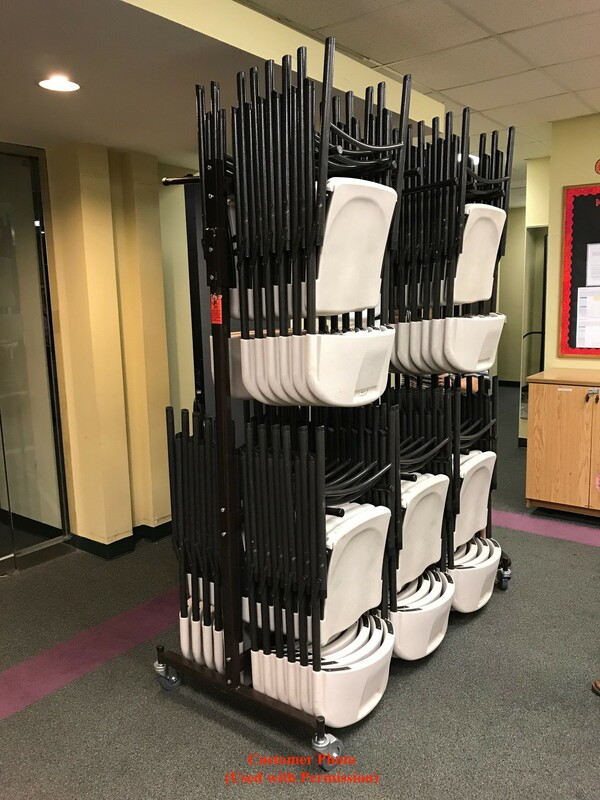 I ordered the chair caddy rack storage cart for use at my church. It is perfect for our needs. The wheels roll easily and smoothly and do not damage our gym floor. Assembly was simple and completed in a very short time by one of our church members. We are very pleased with the quality and price of this item. Q: do you offer replacement casters for the chair carts? Q: I found same item on global for $249.00 can you match price? A: For price matching please fill out the form underneath the price-there is a link called "find a cheaper price". A: To give you an exact quote it depends on the brand of plastic chairs you have, but even the thick lifetime brand chairs-it holds 72 of those. Q: Do you ship to Canada? I assume your prices are in USD. A: We do ship these to Canada. To determine the freight please add the item to your shopping cart and type in your postal code for a shipping quote. Shipping to Canada can be unusually high. Many Canadian customers have it shipped within the 48 states (shipping is free in the US) and then take it over the border themselves. A: t only takes one person to assemble the 84 chair cart. It takes approximately 10 minutes. Q: How many chairs can I fit on the storage cart? A: If they are plain metal chairs you can generally fit 84. If your chairs are padded or extra thick the capacity goes down. Q: Can I fit lifetime chairs on this storage cart? 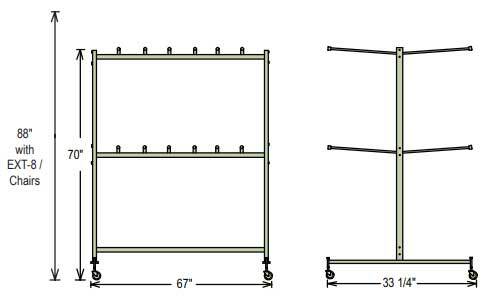 A: Yes, you can fit about 72 lifetime chairs on the storage cart as long as you order the extender. The model number is ext-8 and you can find it under the accessories tab above. Lifetime chairs are taller than most brands. The reason you need the extender is because the bottom and top tier will cause the chairs to bump into each other otherwise. You do not need the extender if you are using plain metal chairs. Q: Is this a good storage cart for churches? A: Yes, it is perfect for most churches. The thing to keep in mind is whether you are storing them in the same room where you set them up. If you need to cross thresholds and doorways please make sure the measurements allow this to be transported with chairs. Shipping time: Generally ships in 48 business hours. Ships from TN, CA, and NJ. Takes about 5-7 days to the East Coast and 5-7 days to the West Coast. Call before delivery: The freight company will contact you to set up a delivery for the NPS 84caddy. It is too large for FedEx or UPS and will arrive through an LTL carrier. Somebody does need to be available to sign for it. Should you notice any damage, please note it with the driver and contact us immediately. Dimensions: 70" x 36" x 10"